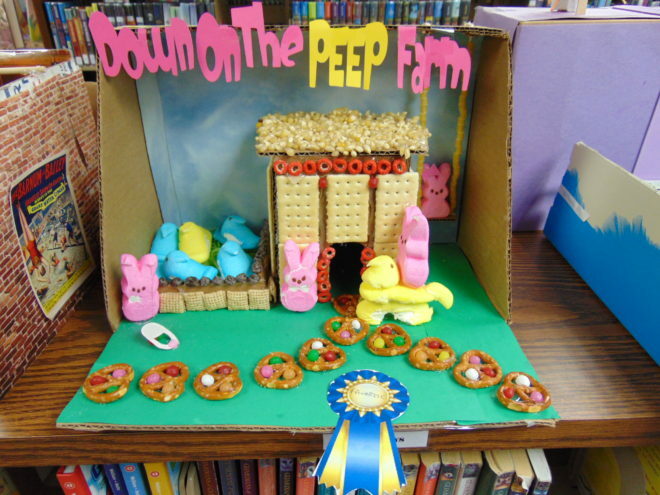 Down on the Peep Farm, #11 in the Kids category, was voted voters’ Favorite. The Ida Public Library hosted a Peeps Diorama Contest in March. All ages were welcome to participate in the contest. Dioramas could be dropped off between March 19 and March 24, and voting began the following week during March 26 to 31. Each diorama displayed a lot of thought and careful crafting. The contest had two categories: Kids ages 5 to18 and Adults over 18. Visitors could check out the diorama display and vote for their favorite. Once the votes were tallied, four winners had been chosen. Two displays from the kids category and two from the adult category. 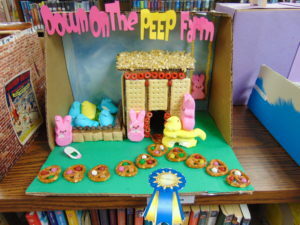 For the Kids, ‘Down on the Peep Farm’ #11 was voted the Favorite and #9 ‘the Passion’ was voted Most Creative. For the Adults, #1 ‘Take Us to Your Readers’ spaceships was voted Most Creative, as was #2 ‘Willie Wonka and the Chocolate Factory’.